Collins Booksellers - Are Workarounds Ethical? by Nancy Berlinger, 9780190269319. Buy this book online. How work gets done in complex health care systems is ethically important. When health care professionals and other staff are pressured to improvise, fix structural problems, or comply with competing policies, the uncertainty and distress they experience have potential consequences for patients, families, colleagues, and the system itself. 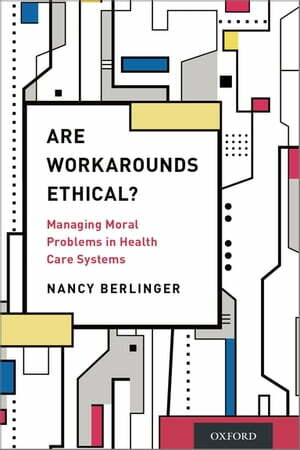 This book presents a new theory of health care ethics that is grounded in the nature of health care work and how it is shaped by the ever-changing conditions of complex systems, in particular, problems of safety and harm. By exploring workarounds and other improvised practices in complex health care systems that are difficult for professionals to talk about openly, yet have unclear effects, including their value or risk to patients, this book offers a realistic look at our changing health care system and how we can improve the way we manage moral problems arising in the care of the sick. Berlinger argues that health care ethics in complex and changing health care systems should reflect the moral complexity of health care work, analyze common ethical challenges with reference to behaviors and pressures driven by the system itself, and support opportunities for health care professionals and staff at all levels to reflect on the problems they face and to take part in social change. The book's chapters include frameworks for looking at ethical challenges in health care as problems of safety and harm with consequences for patients. Are Workarounds Ethical? is designed to support clinician education in medicine, nursing, and interdisciplinary contexts and recommend methods for integrating ethics, safety, and justice in practice.